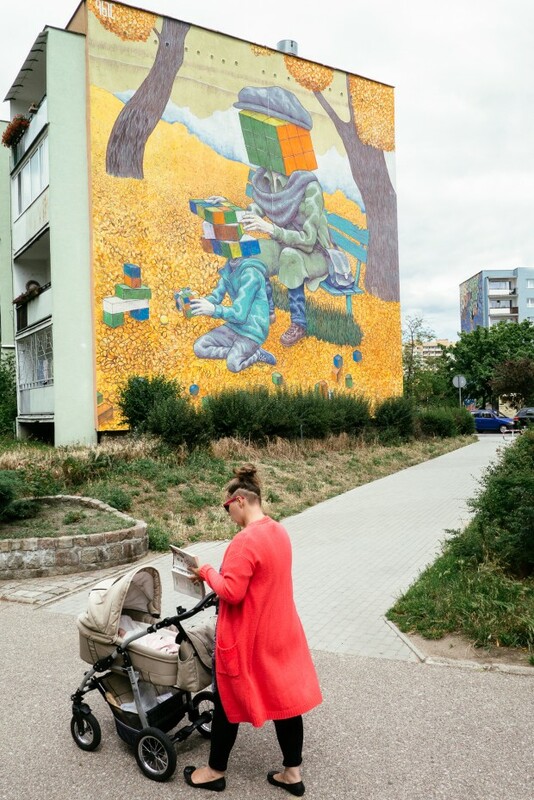 It is the seventh time Gdansk welcomed artists from all around the world to take part in the Monumental Art festival and give Zaspa several new grand paintings. This time, the City Culture Institute invited artists from Spain, Uruguay, Greece, Russia, and Poland. This year’s motto is Each Day Counts. The works began on 29 June, and the results were presented on 10 July. Monumental Art is a one-in-a-million event which (along with various activities undertaken by Gdansk School of Mural) is responsible for the integrated collection of monumental art in Zaspa. The residents of Zaspa, i.e. 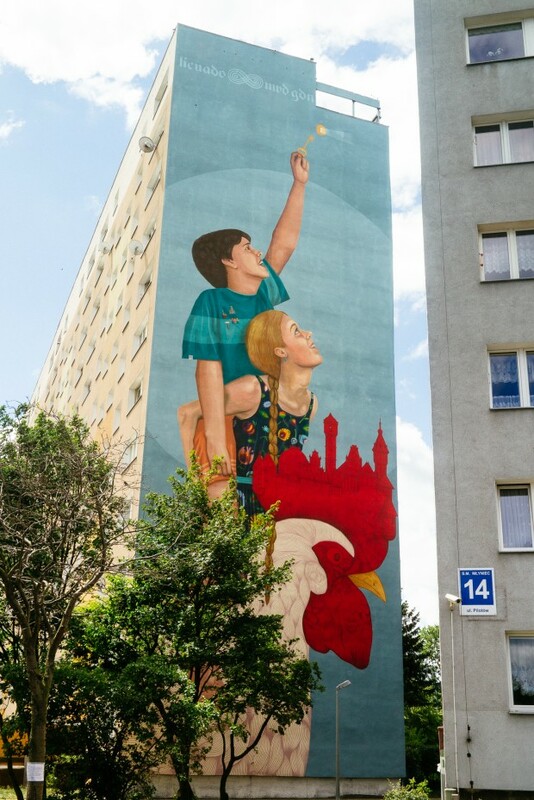 the Local Guides, can take anyone on a tour of the murals, sharing some fun facts on the creation of the monumental paintings, telling the life stories of the artists and presenting their works, as well as explaining the architectural formula of Zaspa and the history of its creation. 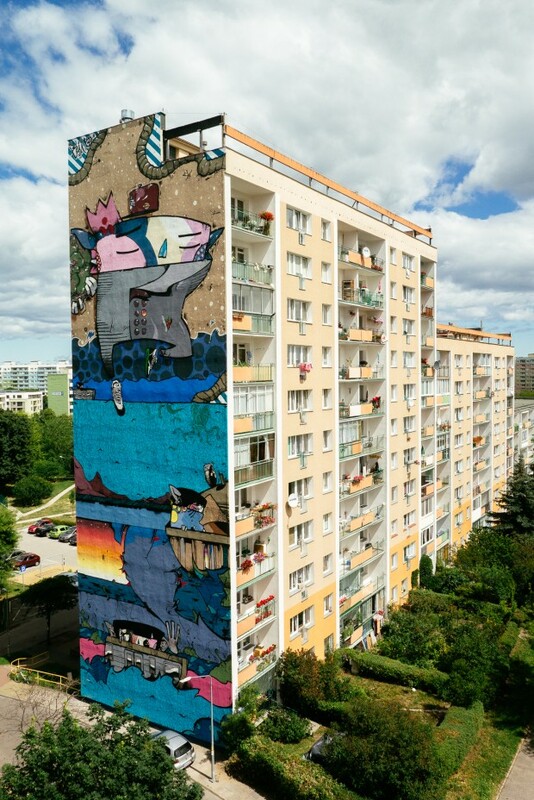 This year, the 5 new murals were painted by David de La Mano and Pablo Sanchez Herrero from Spain, Rustam Qbic from Russia, the Licuado collective and Alfalfa from Uruguay, SAME 84 from Greece, and the Monstfur duo from Poland. The artists were accompanied by two mural artists from Chisinau, as well as folks from Gdansk School of Mural. The Monumental Art festival is an annual event to be organised until 2016. Before 2011, it was one of the events connected with Gdansk bidding for the European Capital of Culture title. In the following years, it has been held by the CCI. The festival’s objective is to create an integrated gallery of monumental art and build the biggest European collection of big-scale paintings by renowned artists from all around the world. The project is curated by Piotr Szwabe aka Pisz (a painter and a culture activist from Gdansk), and coordinated by Barbara Sroka of the CCI. In the collection there are muralas by: Opiemme, 2501, DEM, Run, Prozak, Wallride, Ekta, Jub Monster, Zosen Bandido and many others. Pablo S. Herrero works with disadvantaged areas: suburbs or desolated places nature takes over. He sees murals as interventions in cities reducing the distance between artistic visions and nature. He is now concentrating on small towns and outlying districts. His style evokes floral motifs. It shows the relation between dynamism and inactivity, individualism and community, emotion, power, and control, sustainable growth and instability, fragility and sturdiness. David de La Mano has painted over 100 works in public spaces in Spain, USA, Norway, Tunisia, Argentina, England, Peru, Uruguay, Brazil, Italy, and Portugal. 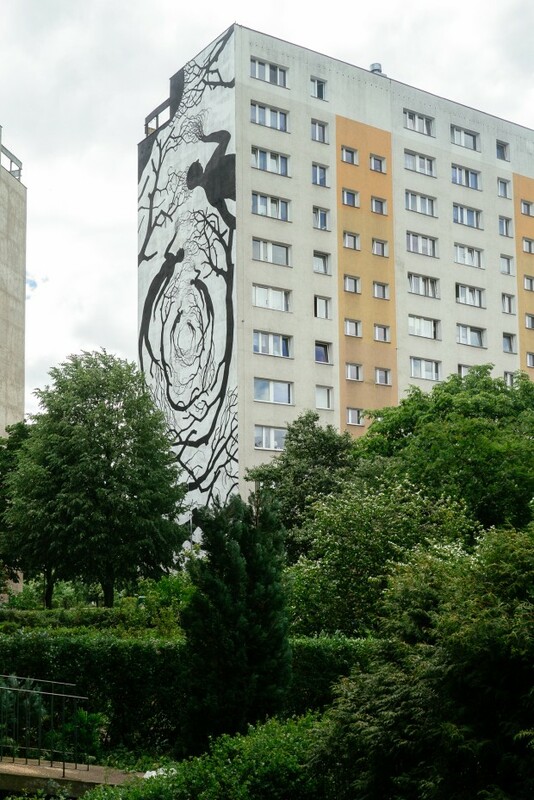 His mostly monochromatic murals present people and trees. Lots of his works have been created with Pablo S. Herrero, and it will too be the case at Monumental Art. The Licuado collective was created four years ago by Camilo Núñez and Florencia Duran. Their aim is collective painting, as they believe the team work adds life to both public and their own private space. Camilo and Florencia explore specific environments, linking them and their culture and traditions, with their own painting and their aesthetics. They have painted in Buenos Aires, Chile, Bolivia, Peru, as well as during the Urban Art Latinamerican Festival or the MUTA Montevideo. Alfalfa aka Nicolas Sanchez. His works are a cornucopia of forms and ideas never losing their individual style. He draws inspiration from religions, especially Hinduism – that is why he often depicts figures with many arms and eyes, and animal heads. There are references to bestiaries from the Middle Ages, too, in the works of Alfalfa; he is especially interested in sea monsters. His style blends French symbolism, colourful pop comics, and street aesthetics. Alfalfa’s murals can be seen in Montevideo, Cumana, Caracas, and Lima. Same84 was born in Athens. In 1996, he started to experiment there with graffiti as “Same”. His style has evolved – he is involved in art in public space, and street art, now. Apart from murals, he is a book illustrator and a graphic designer. He lives and works in Athens. 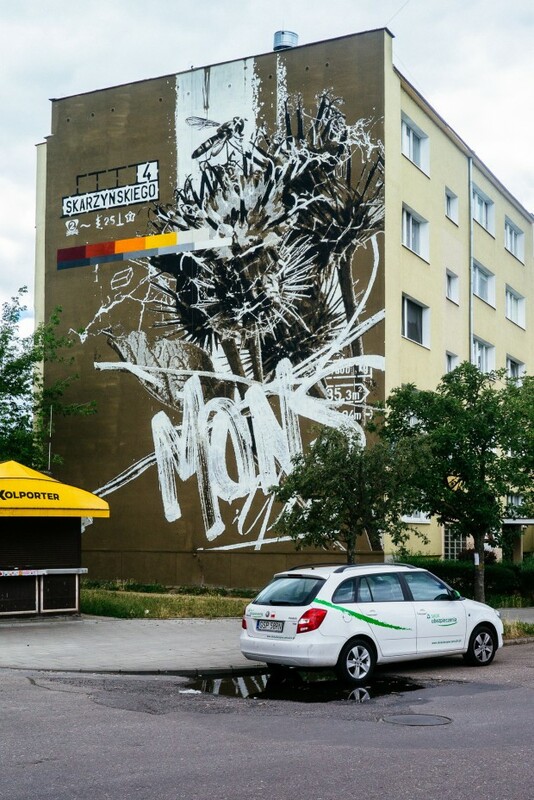 Monstfur was founded in 2006 by two young artists from Częstochowa. It is a joint project and a creation of a virtual author at the same time. Monstfur concentrates on hand-made stencils. It is his favourite technique – precise like movements of an insect, flawless, with lots of room for expression, and open to other media. Monstfur is patient and he likes his job. He draws his inspiration from Polish absurd sense of humour, depicting humans’ curious behaviours and traditions. His works are mostly stories of Everyman and his world of deviations, habits, and weaknesses, but also – joy and remarkable interests. He likes to evoke his early childhood in the 80s – their industry in its general sense, design, and social infrastructure. Monumental Art Festival 2015 is supported by Ministry of Culture and National Heritage of the Republic of Poland.